Evidence is emerging of an association between breast cancer and diabetes; however, it is uncertain whether diabetes incidence is increased in postmenopausal breast cancer survivors compared with women without breast cancer. The objective of this study was to determine whether postmenopausal women who develop breast cancer have a higher incidence of diabetes than those who do not develop breast cancer. We used population-based data from Ontario, Canada to compare the incidence of diabetes among women with breast cancer, aged 55 years or older, from 1996 to 2008, with that of age-matched women without breast cancer. We used Cox proportional hazard models to estimate the effect of breast cancer on the cause-specific hazard of developing diabetes overall and in the subgroup of women who received adjuvant chemotherapy. Of 24,976 breast cancer survivors and 124,880 controls, 9.7% developed diabetes over a mean follow-up of 5.8 years. The risk of diabetes among breast cancer survivors compared with women without breast cancer began to increase 2 years after diagnosis (HR 1.07 [95% CI, 1.02, 1.12]), and rose to an HR of 1.21 (95% CI, 1.09, 1.35) after 10 years. Among those who received adjuvant chemotherapy (n = 4,404), risk was highest in the first 2 years after diagnosis (HR 1.24 [95% CI 1.12, 1.38]) and then declined. We found a modest increase in the incidence of diabetes among postmenopausal breast cancer survivors that varied over time. In most women the risk began to increase 2 years after cancer diagnosis but the highest risk was in the first 2 years in those who received adjuvant therapy. Our study suggests that greater diabetes screening and prevention strategies among breast cancer survivors may be warranted. An association between diabetes and cancer is becoming increasingly recognised. For instance, women with diabetes have an estimated 20% higher risk of postmenopausal breast cancer [1, 2] and up to a 50% increase in mortality after breast cancer diagnosis [3, 4]. This association is hypothesised to be due in part to the effects of insulin resistance and hyperinsulinaemia, which are known risk factors for both type 2 diabetes  and cancer . Other common risk factors, such as obesity and sedentary lifestyle , may also contribute to this association. The risk of future diabetes may also be increased in women following a diagnosis of breast cancer. This risk may be mediated by common risk factors, or diabetes may be a late effect of breast cancer treatment . Indeed, one study among BRCA1 and BRCA2 carriers found a higher incidence of diabetes in those women who developed breast cancer compared with those who did not . However, this was a select population who were genetically predisposed to breast cancer and tended to be younger at diagnosis. To our knowledge this question has not been addressed in women with non-genetic or postmenopausal breast cancer. As breast cancer survival continues to improve , the long-term health consequences for this population are becoming increasingly important to understand. The objective of this study was to determine whether postmenopausal women who develop breast cancer have a higher incidence of diabetes than those who do not develop breast cancer. This study used linked population-based health databases from Ontario, Canada. Women with breast cancer were identified using the Ontario Cancer Registry (OCR), which contains data on all Ontario residents who have been newly diagnosed with cancer or who have died of cancer . The Canadian Institute for Health Information Discharge Abstract database was used to identify hospital admissions and the Ontario Health Insurance Plan database provided information on physician service claims. We obtained information on demographics and deaths from the Registered Persons Database and on diabetes status from the Ontario Diabetes Database (ODD), a previously validated registry of Ontarians with diabetes . These administrative healthcare databases were linked anonymously using encrypted health card numbers. We conducted a population-based retrospective cohort study. Our study population consisted of women who were 55 years or older living in Ontario between 1 April 1996 and 31 March 2008. This age group was chosen to capture postmenopausal women, as over 95% of women are postmenopausal by age 55 years . We identified women with newly diagnosed invasive breast cancer as recorded in the OCR between 1 April 1996 and 31 March 2006. We limited our cohort to women with early-stage breast cancer to avoid differential survival rates that may affect the opportunity to develop diabetes. Because data on cancer stage were not available from our databases, we defined early-stage breast cancer patients as those who had breast cancer surgery in the 4 months before or the 12 months following the diagnosis of cancer, who did not have evidence of metastases at diagnosis and who were alive 1 year after the breast cancer diagnosis date. Cohort entry date was defined as the date of breast cancer diagnosis. Each breast cancer case was matched to five women without breast cancer based on age (within 1 year), who were alive 1 year after index, and they were assigned the same cohort entry date as their matched counterparts. In both groups, we excluded persons with a history of diabetes before the cohort entry date based on the ODD. We also excluded patients with ductal carcinoma in situ and those with a previous non-skin malignancy. To ensure that both groups had a similar opportunity to be diagnosed with diabetes, we excluded those with no healthcare contact in the year before cohort entry. Our primary outcome was a diagnosis of diabetes from cohort entry date until 31 March 2008. 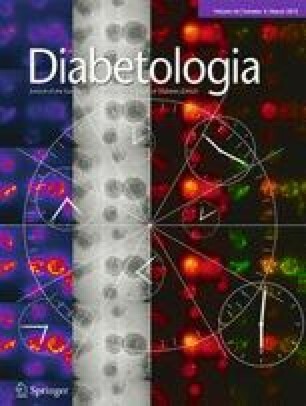 Diabetes was identified based on inclusion in the ODD using a previously validated algorithm, which is based on two physician claims for diabetes within a 2 year period or one hospitalisation bearing a diagnosis of diabetes . Persons in the cohort were followed until the incidence of diabetes, the recurrence of breast cancer (defined as those receiving breast cancer surgery or chemotherapy after 1 year from cohort entry), the occurrence of a new malignancy, death or the end of the follow-up period (31 March 2008). We conducted a Cox proportional hazards regression analysis to determine the association between breast cancer and incidence of diabetes over time. Due to the presence of death as a competing risk (i.e. subjects could die before developing diabetes), we modelled the cause-specific hazard of developing diabetes. To account for the matched nature of the cohort, the Cox model stratified on matched sets, thereby allowing the baseline hazard function to vary across matched sets. The adequacy of the proportional hazards assumption was assessed by examining whether the breast cancer HR varied over follow-up time. This was done by including an interaction between breast cancer and follow-up time in the Cox regression model. Statistical significance (p < 0.05) of this interaction was taken to denote that effect of breast cancer on diabetes incidence varied over time. For all analyses we adjusted for the following potential confounders that may be associated with a higher risk of diabetes or affect disease detection patterns: neighbourhood income quintile; Charlson comorbidity index score (defined using hospitalisations occurring in the year before the cohort entry date ); rural residence and history of cardiovascular event, renal failure, stroke or venous thromboembolism in the 5 years before cohort entry. Patients with breast cancer who are treated with adjuvant chemotherapy may have more advanced breast cancer and shorter survival compared with untreated women, as this treatment is given more often to patients with more advanced disease or hormone receptor-negative cancer . To address this issue and to determine the effect-modifying role of cancer treatment on the risk of diabetes, we stratified women based on whether or not they received adjuvant chemotherapy in the first year following cancer diagnosis. We then repeated the analyses for each cancer stratum comparing their risk of diabetes to 5:1 age-matched comparison groups of women without cancer. Receipt of adjuvant chemotherapy was identified from physician claims for intravenous chemotherapy administration (G281, G339, G345, G359 or G381). Details regarding the specific chemotherapeutic agents were not available. In addition, we only had access to prescription data on a subset of women in this study, and thus could not adjust for use of hormonal therapy or other medications. All analyses were carried out using SAS Statistical Analysis Software version 9.1 (SAS, Cary, NC, USA). This study was approved by the Research Ethics Board of Sunnybrook Health Sciences Centre in Toronto. A total of 24,976 women with newly diagnosed breast cancer with a mean age of 68.5 years were age-matched with 124,880 women without breast cancer who met all the inclusion criteria. Baseline data are presented in Table 1 for the breast cancer and non-breast cancer groups overall, and in Table 2 for groups stratified by receipt of adjuvant chemotherapy. The mean age (±SD) at breast cancer diagnosis was 68.5 ± 9.2 years and our cohort was followed up for a median of 5.5 years (interquartile range [IQR] 3.3, 8.2). Over 12 years of follow-up, we had 133,579 person-years of exposure or ‘at-risk time’ among women with breast cancer and 739,665 person-years of exposure in our comparison group. Our breast cancer group was followed for a median of 4.9 years (IQR 2.9, 7.6), while our comparison group was followed for a median of 5.6 years (IQR 3.4, 8.4) Women with breast cancer were more likely to have a higher income and live in a rural area; they had a higher comorbidity score and had more primary healthcare visits in the year before cohort entry compared with women without breast cancer. Patients with breast cancer who received adjuvant chemotherapy were significantly younger (age 62.5 vs 69.8 years), had a lower co-morbidity score and lower rates of cardiovascular disease and renal failure compared with breast cancer patients who did not receive chemotherapy (Table 2). There were 14,576 women diagnosed with diabetes overall (9.7%) during the follow-up: 2,440 (9.8%) cases among breast cancer patients and 12,136 (9.7%) cases within the comparison group. There were 2,886 deaths (11.6%) among women with breast cancer and 11,725 deaths (9.4%) within the comparison group. All time-to-event analyses modelled the cause-specific hazard of diabetes, controlling for age, comorbidity, neighbourhood income quintile, rural residence and history of cardiovascular event, renal failure, stroke or venous thromboembolism. On multivariable analysis, the test of the proportional hazards assumption rejected the assumption of proportionality. Therefore, the effect of breast cancer on diabetes incidence varied over time so we were unable to report a single HR denoting the effect of breast cancer on diabetes incidence. Instead, using the fitted Cox model that included an interaction between breast cancer and follow-up time, we were able to estimate the instantaneous HR at any specified duration of follow-up time. This approach allowed the HR to vary over time and we calculated HRs separately by year. We reported the HR for the instantaneous effect of breast cancer on diabetes incidence at 1 year, 2 years, and so on, post entry. To assess for the possibility of a detection bias whereby more cases of diabetes are diagnosed shortly after breast cancer diagnosis in the setting of enhanced healthcare, we also calculated the HRs for each month in the first year following diagnosis of breast cancer. We did not find an increased HR at any point during that period (e.g. HR 1.04 [95% CI 0.97, 1.01] at 3 months post entry), indicating that a detection bias is unlikely in our findings. During the course of follow-up, the risk of developing diabetes associated with breast cancer significantly increased only after 2 years of follow-up (HR 1.07 [95% CI 1.02,1.12]) and continued to increase over time up to an HR of 1.21 (95% CI 1.09, 1.35) by 10 years of follow-up (Fig. 1). Among those who were followed for 10 years, by year 10 the cumulative incidence of diabetes was 18.3 per 1,000 person-years among breast cancer survivors compared with 16.5 per 1,000 person-years among women without breast cancer (Table 3). As expected, women with breast cancer had a significantly increased risk of death compared with women without breast cancer, and this remained constant over time (HR 1.34 [95% CI 1.24, 1.44] after 1 year of follow-up and HR 1.36 [95% CI 1.21, 1.54] by 12 years of follow-up [p < 0.001]). Within our cohort of women with breast cancer, there were 4,404 (17.6%) women with a record for intravenous adjuvant chemotherapy. The crude rate of diabetes was lower among breast cancer patients who received chemotherapy than among those who did not (8.9% vs 10.0%); however, this difference may have been due to the younger age of the chemotherapy-treated women (Table 2). When we divided breast cancer patients into treated and untreated groups and compared each group with age-matched women without cancer, there were significant associations between breast cancer and diabetes on adjusted Cox proportional hazards regression analyses. The HR for diabetes changed over time in both groups; however, the slope was different between treated and untreated patients as depicted in Fig. 2. Among patients receiving chemotherapy, the risk of diabetes was highest early after breast cancer diagnosis (year 2: HR 1.24 [95% CI 1.12, 1.38]) and declined thereafter (year 10: HR 1.08 [95% CI 0.79, 1.48]). In contrast, among untreated patients the risk of diabetes increased over time and did not reach statistical significance until year 3 (HR 1.06 [95% CI 1.01, 1.11]). The risk continued to increase such that by 10 years untreated women had a 24% higher incidence of diabetes compared with age-matched women without cancer (HR 1.24 [95% CI 1.10, 1.38]). The cumulative incidence of diabetes by year 10 was 19.6 per 1,000 person-years for breast cancer patients who received adjuvant chemotherapy, 18.0 per 1,000 person-years for untreated breast cancer patients and 16.1 and 16.6 per 1,000 person-years in each respective age-matched group without cancer (Table 4). This population-based study evaluated the incidence of diabetes in a large cohort of postmenopausal breast cancer survivors. Over a mean 6 years of follow-up, we found a small increase in the risk of diabetes among women with breast cancer compared with age-matched controls, but this association varied over time and depended on whether they received adjuvant chemotherapy. For patients who received chemotherapy, the risk appeared to be highest early in the course of follow-up and declined thereafter. Conversely, for non-chemotherapy-treated patients, the risk of diabetes only began to rise 3 years after cancer diagnosis and continued to increase over time. These findings support a need for closer monitoring for diabetes in breast cancer survivors. Very limited literature is currently available regarding the risk of diabetes among breast cancer survivors. While the impact of insulin resistance and diabetes on cancer incidence has been studied , few studies have looked at whether survivors of cancer have a higher likelihood of developing diabetes. We found, in an earlier study, that women with newly diagnosed diabetes had a higher prevalence of breast cancer compared with the non-diabetic population . However, the interpretation of those findings is limited due to the cross-sectional nature of the study. One other study examined this question in a longitudinal cohort of women with BRCA mutations. Compared with women who did not develop breast cancer, women with breast cancer were two times more likely to develop diabetes in the 15 years following diagnosis . Many of those women were premenopausal at breast cancer diagnosis (mean age of 42 years), thus it is possible that the known weight gain that occurs with chemotherapy-induced menopause [5, 6] might have contributed to their increased risk of diabetes. Our study was limited to women diagnosed with breast cancer at age 55 or older (mean age 68.5 years), therefore most would have already completed menopause at the time of diagnosis . The current study provides evidence for an increased risk of diabetes among breast cancer survivors who were most likely already menopausal at the time of cancer diagnosis. The relative risk of diabetes related to breast cancer was not constant over time, and the timing of this relationship was dependent on whether adjuvant chemotherapy was given. For the majority of cancer patients, we only began to observe an increase in diabetes incidence beginning 2 years after cancer diagnosis. This finding may indicate a more long-term metabolic effect of cancer or its therapy in this population. However, we found that women who received adjuvant chemotherapy experienced a higher rate of diabetes within the first 2 years after breast cancer diagnosis compared with age-matched controls without cancer. While the reasons for this observation are not clear, it is possible that chemotherapy treatment may bring out diabetes earlier in susceptible women. Increased weight gain has been noted in the setting of adjuvant chemotherapy for breast cancer, which may be a factor leading to the increased risk of diabetes among women receiving treatment [9, 18]. Oestrogen suppression as a result of chemotherapy may further promote diabetes; however, this factor may be less of an issue within the postmenopausal population [8, 9, 19]. In addition, to reduce nausea associated with chemotherapy, glucocorticoids are often simultaneously used  and this has been associated with acute hyperglycaemia, although no long-term impact on diabetes risk has been shown [20, 21, 22, 23]. The transient nature of diabetes resulting from the glucocorticoids [18, 21] may account for the higher odds initially following breast cancer diagnosis and its subsequent decrease, due to a depletion of susceptible individuals from the at-risk population . Finally, it is possible that patients receiving chemotherapy are monitored more closely and thus more likely to be screened for diabetes than non-treated patients. The precise mechanism for our findings is still uncertain and further studies will be needed to further explore this relationship. Strengths of this study include the population-based nature of our cohort, and access to comprehensive validated cancer and diabetes registries. We also had a long follow-up and a large sample of patients to study. However, some limitations warrant mention. As in all observational studies, we cannot exclude the role of selection bias. For instance, patients with breast cancer may have more health contact with more opportunities for diabetes screening. However, the risk of diabetes increased over time in the majority of our patients whereas one might expect the influence of enhanced healthcare to be greater in the period after cancer diagnosis. It is also possible that the long-term diabetes risk for breast cancer survivors was underestimated due to the competing risk of death in that population, an issue that was partially addressed by modelling the cause-specific hazard of diabetes. We also lacked data on several risk factors for diabetes, such as body mass index, family history and other metabolic and clinical factors. We also did not have information on prescription drugs, such as glucocorticoids, or hormone therapy, such as tamoxifen, which we have shown to be associated with increased risk of diabetes in older women , or information on cancer stage. Finally, as some physicians may not submit claims for chemotherapy administration due to remuneration from alternative funding plans, we may not have captured all instances of chemotherapy treatment in our cohort. We also did not have information on specific chemotherapeutic agents and further research will be needed to explore the potential metabolic effects of these agents. In summary, this large, population-based study found a modest increase in the incidence of diabetes among postmenopausal breast cancer survivors compared with women without cancer. This risk began to increase 2 years after cancer diagnosis and continued to rise over time. However, in patients who received adjuvant chemotherapy, the risk of diabetes was highest early after diagnosis and declined thereafter. The reasons for this relationship are uncertain, and further research is necessary. In the meantime, greater diabetes screening and prevention strategies among breast cancer survivors may be warranted. This study was supported through provision of data by the Institute for Clinical Evaluative Sciences (ICES) and Cancer Care Ontario (CCO) and through funding support to ICES from an annual grant by the Ministry of Health and Long-Term Care (MOHLTC). The opinions, results and conclusions reported in this paper are those of the authors. No endorsement by ICES, CCO, or the Government of Ontario is intended or should be inferred. The authors acknowledge the contribution of H. Fischer (ICES, Canada) for administrative support. CCO and the Ontario Institute for Cancer Research (through funding provided by the MOHLTC and the Ministry of Research and Innovation of the Government of Ontario) and a Canadian Diabetes Association/Canadian Institute of Health Research (CIHR) Clinician Scientist Award, which also provided salary support for L. L. Lipscombe. L. L. Lipscombe currently receives funding from a CIHR New Investigator Award. P. C. Austin was supported in part by a Career Investigator award from the Heart and Stroke Foundation. LLL conceptualised and designed the study, interpreted the data and drafted the manuscript. WWC contributed to the study design and drafted the manuscript. LY acquired and analysed the data and critically revised the manuscript. PCA contributed to the study design, analysis and interpretation of data and critically revised the manuscript. GMA and PAR contributed to the study design and interpretation of data and critically revised the manuscript. All authors approved the final version of the paper to be published.